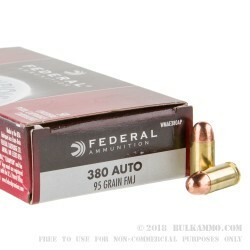 A serious bargain for a 380 round that has been proven to work with many of the hardest to please .380 autos on the market, this is the 400 round case lot of the Federal Champion .380 full metal jacket load. A very simple cartridge: this is a classic load from the Champion line and it has a history of offering good performance for a traditionally hard to match caliber. 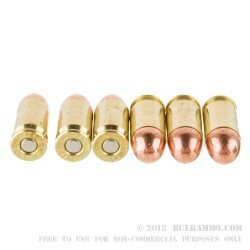 The larger projectile offers a bit more heft on the speeding bullet that tends to smooth out the snap on the muzzle exit; the round nose and well finished cartridge casing offers the best chance of feeding in tight, rough actions that are famous in the .380 builds of today’s value-priced personal defense market offerings. 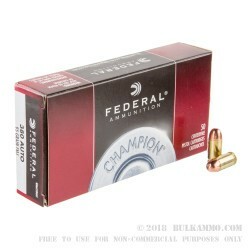 This is a great round by virtue of price and case size, for bulk shooters and the historical reliability of the Federal Champion line is well-known. 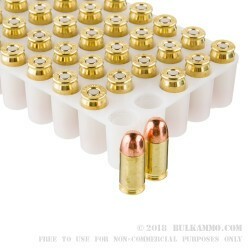 The case is constructed of 8 boxes with 50 rounds in each box. The fully jacketed projectile is a great plinking and target bullet profile and offers a lower price point. The reloadable brass means you can get a cheap donor case to play around with custom loads or to save a bit of cash on your next round of shooting. Though, it should be said, for new ammunition this price is exceptional, and may negate much of the gains hoped for in reloading.